Shape into bread by rolling like a swiss roll and placing into a prepared loaf tin. Round the top of the loaf Sprinkle with flour. 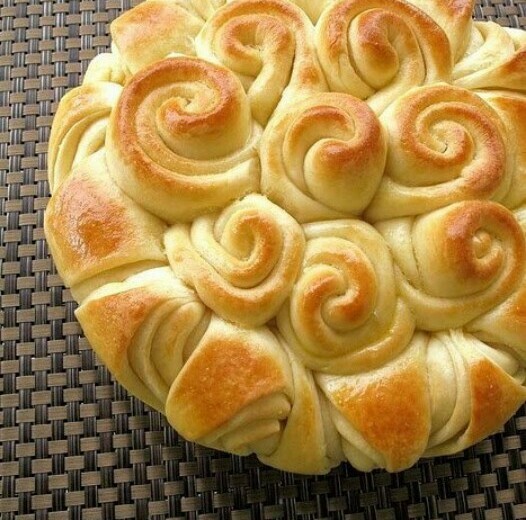 Form dough into a large round 18cm ball. Using a sharp knife, or razor, slash the surface if the dough in a criss-cross pattern. Shape bread by rolling like a swiss roll and placing into a prepared loaf tin. Using the left over dough, divide it into three and roll into long sausages to cover the length of the tin. Plait and place in top of bread and press plait slightly. Shape dough into large oblong rounded shape. Poke dough with finger to create lots of decorative holes. Place on baking sheet. Divide dough into 12 equal portions. Form each into a smooth ball. Place two layers of evenly spaced balls in a daisy pattern in a round prepared tin. The double layer of dough created a beautiful daisy pattern. Place seeds in the centre of the daisy and any other topping on the sides of the daisy. Roll dough to the thickness of a pencil and to the length of 30cm. Sprinkle with rock salt and sesame seeds, cheese or garlic. Roll dough to form a 25cm x 45cm rectangle. Spread filling of choice to within a border of 2cm. roll dough starting with the wide side, with the seams underneath. Seal ends with water pinching it together. Place on prepared oven tray. Snip with scissors from the outside edge 4cm apart. Turn cut pieces on side and flatten slightly. Filling should be exposed. Neaten and form into a round ring. Shape into a rectangle. Spread filling over dough. Roll like a swiss roll, pressing tightly to form a loaf. Place in a prepared loaf tin. Shape dough into a rectangle. Spread with filling or leaf plain is desired. Roll dough up, starting lengthwise to form a swiss roll. Seal edges well by pinching close. Twist half of the dough to the right and the other half left, holding and twisting so the that the shape is maintained. Place on a prepared baking sheet. Roll dough into 25x30cm rectangle and fill with desired filling. Roll up the dough starting from the wide side. Cut the roll in half lengthwise, using a sharp knife but keep 10cm intact/ uncut. Turn each half cut-side up and carefully twist the halves together, keep the cut-side up to expose the filling. Keep a round piece of dough aside. Shape remaining dough into a smooth round ball and place into a prepared tin. Roll dough out into a 40x25cm rectangle. Spread with filling Roll dough up lengthwise, forming into a neat swiss roll. Use a sharp knife and cut into slices, about 5cm in width. Neaten, but dot not flatten the slices.Arrange slices evenly spaced, but close together on a prepared tray with the seams inwards. Neaten ring. Cut dough as per drawing. The approximate size of the rectangle should be 35x30cm. Place filling and cut the dough into strips at the wing. Do not cut through to the filling side. Fold strips of dough in criss cross fashion over the filling Close bottom piece before getting to the end of folding strips Neaten off and pat sides straight. Divide dough into two equal pieces. Roll each piece into a 50cm stand and pace 2 strands in the form of an X. Take the top right hand end and place it on the inside of the bottom left hand end. Place left bottom end to the top. Repeat the process with the two alternative ends and plait until all the dough has been used. Seal the edges well together. Pinch ends well together.